This sweet little lady is ONE year old. 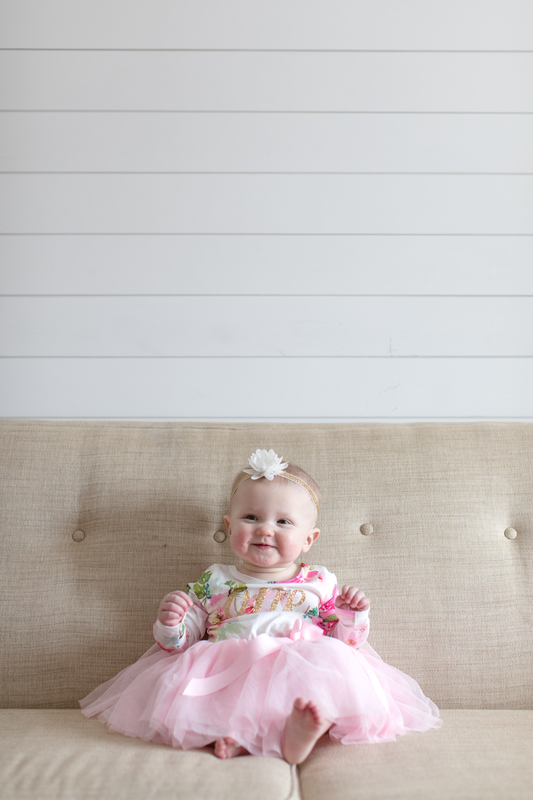 I had a blast shooting this first birthday session. I love using your home to capture photos at any age. Plus, if you have somewhere with nice natural light and minimal props, a smash cake session can easily be done! I know there are tons of lists out there and that each family / baby likes things differently, but here are some things we found made newborn life easier! My all time favorite come home outfit for winter babies is from H&M. These cross body snap onesies and footie pants are perfect. No need to pull something over their head and no need to try and get socks on them. Both of my kiddos wore these for outings a lot their first few months of life. They come in a bunch of colors / patterns and sizes. Gowns! It makes changing a million diapers so much easier. Especially in the middle of the night, no snaps or zippers. You can get them just about anywhere you can buy baby clothes. I’d like to consider myself a professional baby wearer. I still wear Ada at 13 months. We LOVE our Sakura Bloom ring sling. I used this for both Clark and Ada. The ring sling is the image in the top right. The other sling I used (especially when she was a newborn) is the Solly Baby wrap, shown on the bottom row. It took a few times to get the hang of tying it tight enough but soon enough I was wearing her daily in this. Both helped especially through fussy phases. Remember you always want to wear your babies close enough to kiss! The DockATot is a big must have for us. It really helped us in those first 6 months. Ahh, the good old BabyBum brush. We can’t help but love this product. It’s so nice to apply diaper rash cream without getting it on your hands. I love gifting this! Both of my babies loved the 4moms mamaRoo. We kept ours in the kitchens so when it came time to cook meals they could hangout with us. The Wonder Weeks app is amazing. It really is so interesting to read and understand the timing of certain growth spurts / leaps. Sometimes being able to check that app gave peace of mind when I wasn’t sure why either kid was so clingy. But learning about what they were going through really really helped. Another app I love is Sprout Baby. I mainly use this app for tracking nursing sessions. Both of my kids only nursed on one side each feeding, so when I couldn’t remember which side I had previously nursed on it was helpful. You can also track their growth amongst other things. Worth the money, for sure! A humidifier! If they get colds when their little there is only so much you can do besides the nasal aspirator. The Crane Ultrasonic Cool Mist Humidifier worked wonders. Best swaddles, hands down! The Love to Dream Swaddle Up Original let’s your kids sleep with their hands up by their face but helps with their startle reflex. Ada hated having her arms pinned down and always wanted to move them by her head, but when we’d let her sleep unswaddled she would constantly wake herself up. This was a life saver. When you need to go up a size, the Love to Dream Swaddle Up has arms that zip off!!! When Ada was starting to roll we could unzip one arm at a time to make the transition easier. I love this product. Both of my kids were spitter uppers. We couldn’t just use small burp cloths, we basically needed ponchos. These Carters receiving blankets we’re my favorite. This is totally a splurge but the Keekaroo Peanut changing pad is awesome. It made changing them an easier process because we could just wipe it down afterwards. We got Clark a Hatch Baby Rest night light when he was 2 years old. This is a sound machine and night light rolled into one. One of my favorite features is that you can control it from an app on your phone. My second favorite feature is timing the light or sound. This was perfect for letting Clark know when it was morning. He might wake up at 6:30/7 but if the light was still orange it was bedtime. When it turns blue it’s morning and he can get up! We got one of these for Ada now too. I love the newborn cuddles and everything about the newborn stage, but being tired is REAL. Anything to help make that stage easier I am all for. Better late than never, hah. I am a year postpartum but these must haves will be on my list for our next baby. (Fingers crossed!) I learned so much from having Clark that these things helped me after Ada’s birth. If you’re going to breast feed, a lot of these things pertain to that. Snacks. I was SO hungry while nursing. Especially in the middle of the night. Have lots of healthier snacks on hand. A good big coffee/tea mug is crucial. A water bottle is also crucial, especially for nursing. Drink ALL the water. A good nursing nightgown. I had night sweats after both kids while my hormones leveled out, so having light clothing but easily accessible for nursing was awesome. I am a nightgown kinda person anyway, so I had a few already. Nursing bras. I LOVE all of the Bravado bra’s I own. I’ve tried a lot of different nursing pads, but the Bamboobies ones were my favorite. I think I just put our Boppy away and I nursed Ada over a year. It’s helpful to have good posture while nursing! This aided in that and I learned it the hard way. Postpartum high waist support leggings. These Blanqui ones helped me feel like my belly stayed tight post baby. Plus it was nice to wear high waisted things while nursing. I could lift my shirt up and didn’t feel like I was super exposed. A sitz bath. Girls, DO THEM if you have a vaginal birth! I swear this really aided in my healing time. This was also my few minutes a day of alone time post baby. Take the perinal bottle they give you at the hospital! It’s a life saver in the beginning. It’s easy to get overwhelmed once you’re home with baby. The other postpartum must have I didn’t list is a support system. Your partner, family members, girlfriends… don’t be afraid to ask for help!